The sad day has arrived: my final week in Pingtung. Last month I was contacted by someone working for the Pingtung County government. Would I like to take a 15 day vacation in Pingtung, write about it on the blog, do a write up for the County, and get paid? You bet! Today I offer the last installment of my vacation in Pingtung: Under an Onion-Scented Sky. The last two weeks have been onion harvest time, and in the farms of Kenting, the smell of onions filled the air. Saturday morning we decided to take one of my favorite routes on the island, the 199 to 200 loop in Kenting (here is a Google map of the route). This lovely route of easy grades and low hills offers beautiful views of farms, hills, and the ocean, and ends with a long roll down into the gorgeous valley in Manjhou township. 85 kilometers of pure pleasure. Checking the weather at 7-11 here in the morning, it looks like a puffy white cloud day. Yay! In the morning the onion vendors are setting out their goods. My henchmen Michael Cannon and Jeff Miller at rest on Rte 151, which runs between 26 and 199. A pleasant ride through the farms north of Hengchun. It was great to have some company for my last week in Kenting. Jeff shoots some men at work. Harvesting onions. That's the artillery range in the background. Egrets feeding in the wake of a tractor dodge a blast of dust. Right near where 151 meets 199 is the tomb of the Okinawan Sailors, whose deaths at the hands of local aborigines furnished a pretext for the 1874 Japanese expedition to Taiwan. Note how the characters for "Greater Japan" at the top of the stele have been blotted out. After riding through the spa town of Sichungxi, we came to the Stone Gates, the gorge where the battle was fought in 1874. In Shihmen town we stopped at this well-stocked local curio shop inside a B&B called the Mudan Shanchuang. Just past the dam the climb begins. It is only a couple of hundred meters, but the views out over the dam and surrounding hills are stunning. As you can see, the weather stayed good the whole day. 199 winds through farms, forests, and small towns on its way to Taidong county. Jeff and Michael race to beat a cement truck. At this point, 199 splits -- 199 continues NE over the mountains to Taidong county, while 199A heads east to the ocean and the town of Syuhai, a tourist spot for its large grassland and hot springs. Kenting always feels more like SE Asia to me than Taiwan. Perhaps it is the water buffalo. Finally you start the long, enjoyable alpine descent to the ocean and Syuhai. Excellent views the whole way down. The police station at the corner of 199A and 26 offers the full range of services, include two friendly golden retrievers to pet if you miss your dog. 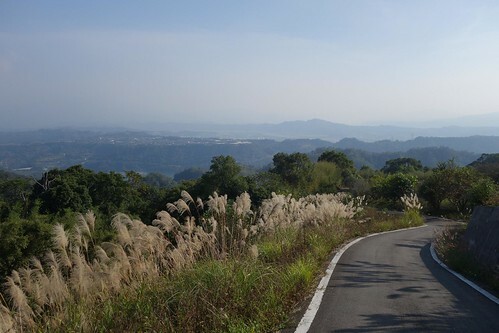 This desolate, undeveloped section of 26 is one of the loveliest stretches of road in Taiwan. A woman probably collecting either seaweed or abalone among the rocks. Jeff and Michael work their cameras. The best parts of Kenting are away from the beach area. Enjoying the seaweed covered rocks. Lunch brought us to the tiny fishing port of Gangtzai. The dunes there are the site of a large rental business. Visitors can rent jeeps and drivers, or ATVs, and spin out on the sand for fun. Jeff asked the boss if she would make us some of the local greens. Here is what she served us -- green peppers in black bean sauce. Yum. As we ate, these apparently Taoist believers gathered for a ceremony on the beach. They threw what appeared to be ghost money into the sea. For the dead at sea? 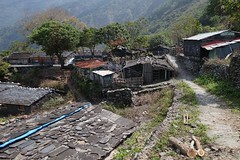 After lunch, we started climbing again, up 200 to the tiny hamlet of Fenshuiling. The road climbs through forested hills, a pleasant ride with an easy grade, with good views out over the ocean and surrounding peaks. In Fenshuiling we were greeted in English by this shop's owner, who had been in the Merchant Marine. 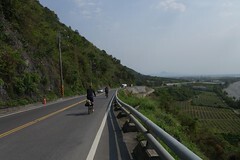 After Fenshuiling the road descends to the town of Manjhou, a sweet ride through the green agricultural lands in Manjhou township. Also one of my favorite stretches of road on the island. I'm getting a farm here. Fields and farms of Manjhou. In Manjhou town soldiers were out practicing their trade. The local landmark in Manjhou. After recharging at the 7-11 in Manjhou we continued along 200 to Hengchun. Soon we reached the old East Gate in Hengchun town. Breakfast time on Monday. Sunday we rode around Euluanbi and then in the farm roads between Hengchun and the ocean on the west side of Kenting. I left the camera at home so I could enjoy the ride (see the pics from last week, same ride). The previous week I had reserved a time for us to enter the Nanren Shan Conservation Area, a parkland and protected nature area in Manjhou township north of the town, accessible by road from 200. The trails are allowed only 150 visitors a day, so you have to register online to get a date (closed Tuesdays). Monday at 8:10 sharp we arrived. At the park office. When we arrived a light rain was falling. Before entering the area, visitors must watching an 8 minute briefing movie in Chinese. On the trail. The trail winds around Nanren lake for 10 kms or so, with easy elevation gains. It is a lovely, peaceful walk. The trail is well marked, with plants and animals described in signs in English and Chinese along the trail. 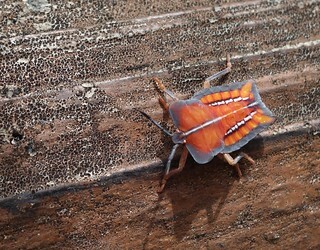 Critters of every kind fill the area. We saw plenty of monkeys and birds, and bugs of every description. Raindrops on a flower. 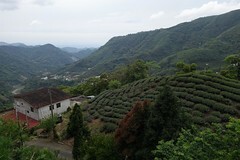 On a clear day Nanren Shan would yield some lovely photos. Highly recommended. Most of the critters were sensibly hiding from the rain, which began to progress from light rain to drizzle to intermittent downpour. Only we dumb primates were out walking around in that. Photography soon became difficult as the skies emptied themselves, but I did manage to get a few photos. We turned back after going in three kilometers. Our bedraggled arrival at the Park Station is captured above. For me the highlight of the trip was stumbling across this walking stick. In the afternoon Jeff and I rode around the small farm lanes in the Hengchun area. We ended up back at the West Gate in Hengchun. Here is the brick oven pizza place by the West Gate, Let's Pizza, with its friendly owner. What an incredible experience this has been for me. I've been so many different and special places, met so many wonderful people, and seen so much that I've never seen before. I'd like to thank the government of Pingtung County for making this possible. I hope you, dear reader, have enjoyed this series as much as I have. Great stuff. You guys missed the free hot in Xuhai. Also, I'm pretty sure those folks on the beach were doing the Zhaohun (招魂) ceremony to call back the soul of someone who died there. Probably someone drowned. If you saw someone holding a stick of bambo with a pennant tied to it and items of clothing that would confirm it. I really appreciate the invitation to come riding along. It was good to be welcomed back so generously in Taiwan after being away. The cool breezes with a hint of salt made me feel calm and at home. I'm looking forward to the next ride. Indeed, I enjoyed this series very much. Great work. 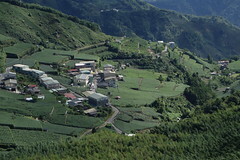 Pingtung County is a great place for traveling.I always drive from Taipei to Pingtung in summer time. I did enjoy you posts, Michael. Not as much as you must have writing them. What a nice gig. Good work! Thank you very much for sharing the photos. I had the great pleasure of going through the same regions in October with my family and my wife and I recognized a great number of places in your pictures where we had been. Michael, could I ask what kind of bike it is that you are riding in this series (and, I guess, usually)? I can't quite figure it out. Anon, I ride a G2C road bike, the 7.1 version. G2C makes frames for a major US brand and decided to launch their own brand. They have a retail establishment in Taichung. The frame is a small with a 51 CM top tube. It has a carbon fork and carbon chainstays, and carbon in a couple of places on the tube. Very nice frame. The groupset is SRAM Apex, 11-32 cassette, 50-34 compact dual up front. Wonderful for the hills. I ride Mavic Open Pro wheels, strong touring wheels since I am heavy. With the stock wheels, you can probably get this bike for under $43,000 depending on what handlebars, groupset, etc, you chose for it. The rack is a Topeak rack carried over from my old bike. The handlebars I carried over from my old bike, I will probably swap them out in a couple of months. It's a fantastic bike, very smooth ride and good climber. I'm delighted with it. Highly recommended. Is the Other Candidate Gay? What's the Hold Up on Arms sales?